Paris―Paris was struck in its very heart on Monday as flames devoured the roof of Notre-Dame, the medieval cathedral made famous by Victor Hugo, its two massive towers flanked with gargoyles instantly recognizable even by people who have never visited the city. In Manila, Malacañang extended the Philippines’ message of solidarity to the French community after flames devastated the historic cathedral. 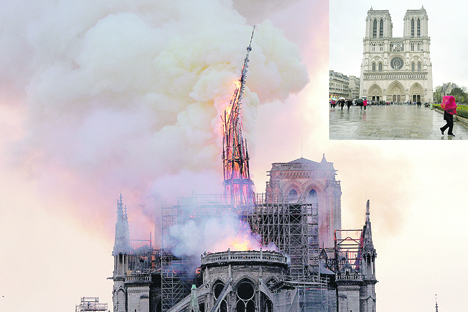 In a statement, Presidential Spokesman Salvador Panelo said the Palace is “deeply saddened and bothered” that the blaze destroyed the spire and roof of the 850-year-old cathedral. The iconic cathedral has been deeply enmeshed in Paris’ history since construction began at the end of the 12th century—historians generally ascribe the date 1163—and lasted more than two centuries to 1345. Its massive tenor bell announced the liberation of the city from Nazi control on Aug. 24, 1944, ending the dark years under German rule in World War II. Twenty-six years later, it hosted the funeral of Charles de Gaulle, a rare honor for the leader who steered France’s resistance during the war. For French Catholics, it has particular resonance, as the resting place of the crown of thorns believed to have been placed on Jesus’ head before his crucifixion. In modern times the church became a lodestone of Western culture, thanks in large part to its starring role in several movies, not least the “Hunchback of Notre-Dame” of 1956.